A Clearing in the Woods at India Flint’s School of Nomad Arts starts February first! I’ve been preparing since October when I made quantities of little circular bundles using different plants and objects and dyes. Those bundles are in jars resting comfortably in my studio, no mold or explosions experienced. I purchased a scarf in a silk cotton blend to use for the project. 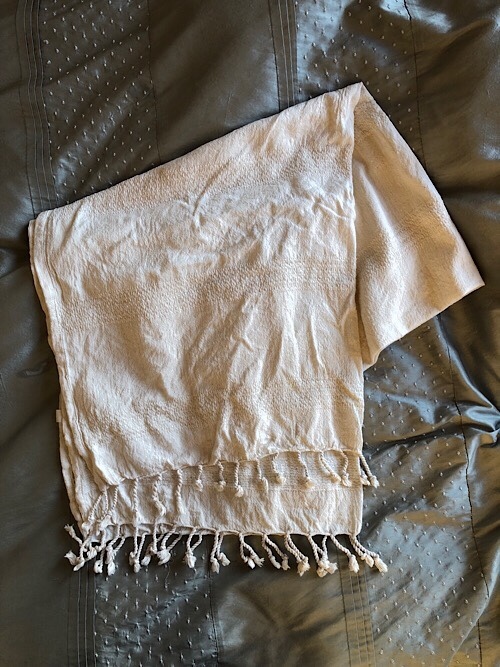 Over the past few days I’ve dyed the white scarf with avocado pits and skins. I had stored up a quantity in the freezer. 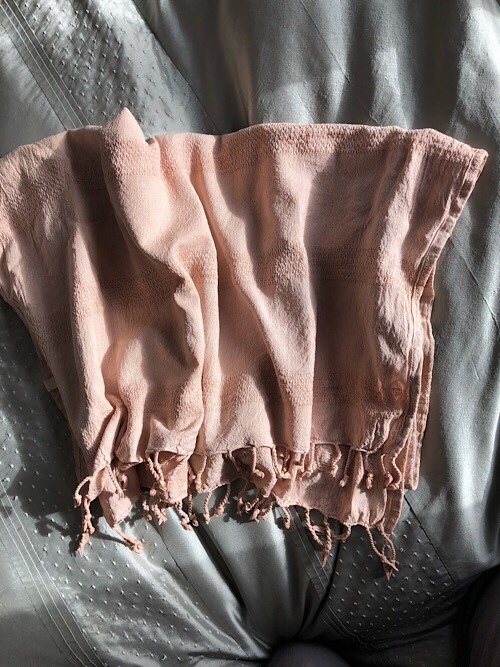 Scoured the scarf by washing it in the sink with washing soda and dish detergent. Rinsed it as best I could by hand. It dried out afterwards but I don’t think that mattered much. Thawed the avocado out of the freezer and washed / scraped off the most obvious remaining bits of green flesh. 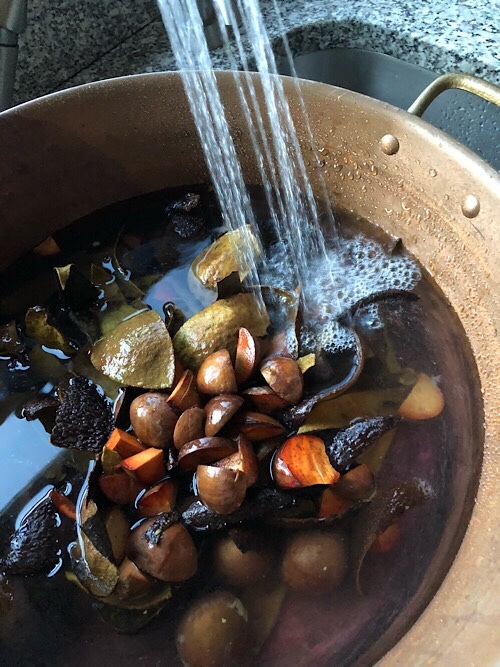 Dumped avocado into my copper dye pot. Added tap water, no other amendments. I thought about washing soda or bicarbonate or cream of tartar (alkaline), which might have brightened the pink color. But decided to keep it simple for the first try. Simmered on the wood stove and the cooktop. The wood stove heated the brew but wasn’t enough to get to a consistent simmer. So I moved it to the stove burner. This probably took a little over an hour. Decanted the brew into my electric cooker through cheesecloth. This step was important to eliminate a lot of floating particles. I’m glad I have two dedicated vessels for dyeing. Added my scarf to the cooker, stirred, covered. I did not apply any more heat. Left it for approximately 30 hours (overnight). 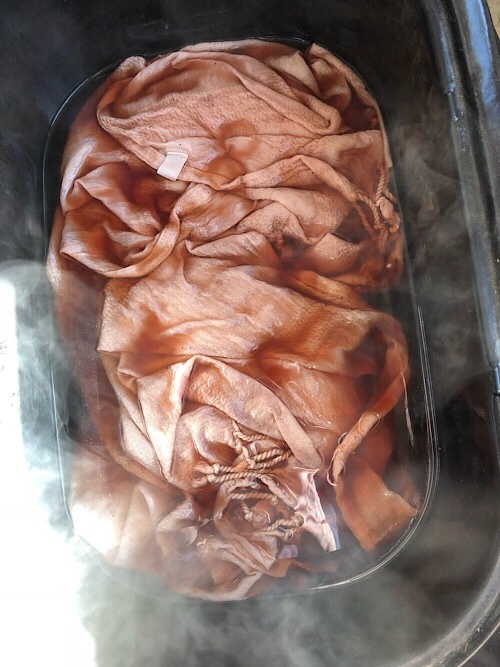 I rearranged the scarf in the dye a few times but it didn’t seem to be picking up color unevenly. Dripped the scarf dry in the bathtub. I only had to pick a few particles off the fabric. The bathtub is a little pink, but I think that will come off eventually! Not sure how or when I will launder the scarf. It feels a little stiffer than I’d like, so I’m tempted to wash it. Looking forward to starting this February project soon!